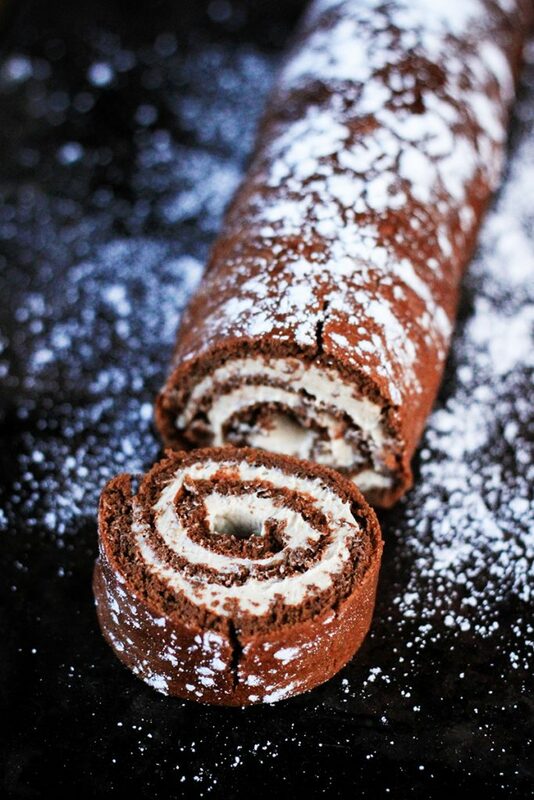 This gluten free and paleo friendly chocolate roulade recipe is a beautiful dessert. The greatest part, in my opinion, is that it looks impressive but is actually super easy to make. 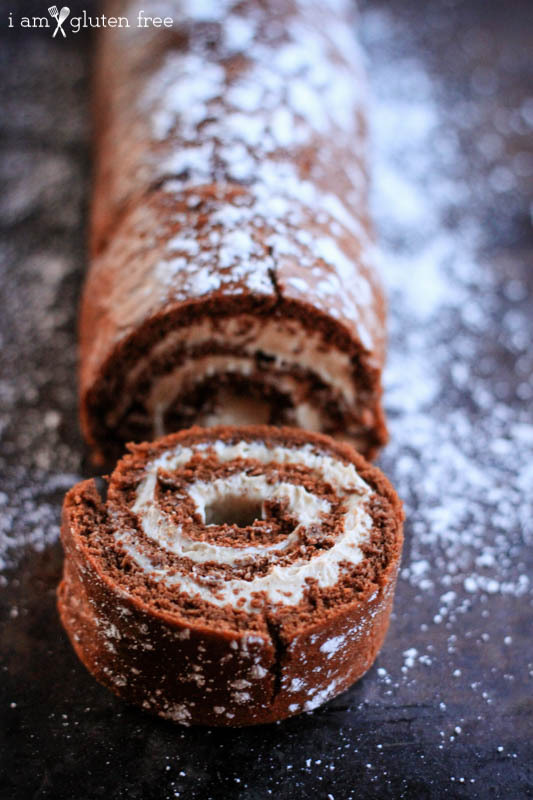 Though a chocolate roulade, or “yule log” is generally a Christmas dessert, it’s something I make year round. 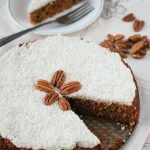 I’ll be making it more and more in the future as well, I think….since I can foresee it becoming one of my go-to paleo dessert recipes (I like to have a few of those up my sleeve). It is true that the frosting pictured in the chocolate roll photos is not a paleo frosting. It contains dairy, though no refined sugar. 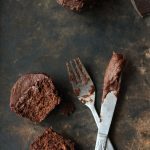 I’ve linked to a paleo frosting recipe below the chocolate roll recipe, but it comes out slightly darker in color…so expect that it will look a little different. 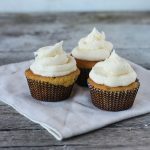 If you do want to make the frosting pictured (no refined sugar but does contain dairy), it’s a simple recipe: 4 ounces cream cheese, 1/4 cup butter, 1-2 tablespoons honey (test to sweetness), 1/2 teaspoon vanilla extract, and 3 tablespoons peanut butter. Melt the cream cheese, butter, and honey down in a double boiler and stir in the peanut butter and vanilla. Looking back now, I think some chopped dark chocolate would have been really good mixed into the icing for some texture, so I recommend you add that. Then just refrigerate until use! 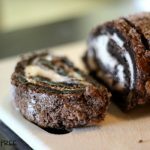 There are also some delicious sugar and dairy stuffed frostings linked to below the chocolate roll recipe! Anyway, on to the gluten free chocolate roulade recipe. 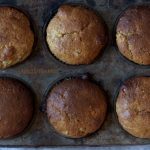 Enjoy…and wow all your paleo and non-paleo friends alike! This impressive dessert is not only surprisingly easy, it's also surprisingly paleo! 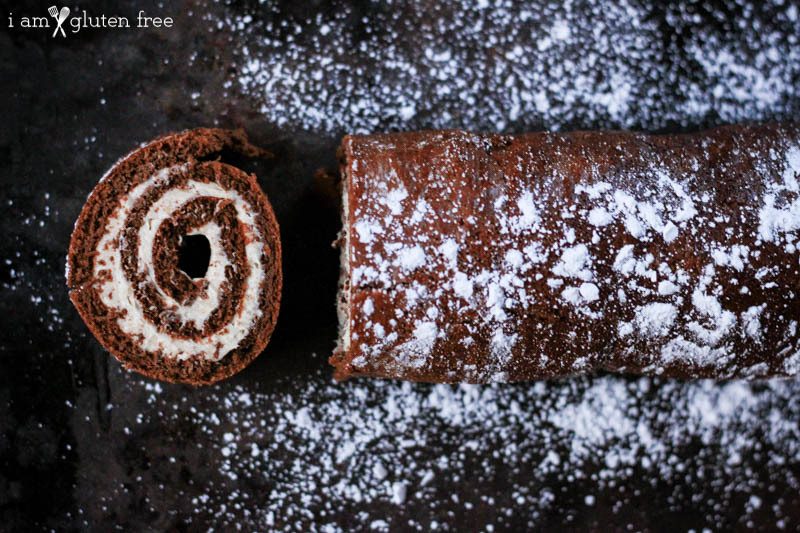 Enjoy this paleo and gluten free chocolate roulade next time you make dessert! Preheat the oven to 350 degrees F. Spread parchment paper over a cookie sheet with edges that is about 16 inches by 12 inches in length and width (you don’t have to have a pan exactly this size...just somewhere in that range). Grease the parchment paper well with oil of choice (I used olive oil). Put the honey, vanilla extract, salt, and chocolate on a double boiler (to make a double boiler, just fill a small saucepan about 1 inch high with water and bring to a boil. Put a bowl on top that is wider than the mouth of the saucepan so it sits over the water without touching it). To melt chocolate in a double boiler, turn the heat to just medium heat without letting the water boil. Occasionally stir gently. While the chocolate is melting, separate the eggs, careful not to mix any egg yolk with the egg whites. Add the 1 tablespoon water to the egg yolks. Beat about 1 minute, until the egg yolks are thicker and lighter. Once the chocolate and honey are completely melted, add the cocoa and stir until combined. Pour the chocolate mix into the egg yolk mix, stirring as you add so the eggs don’t cook. Stir until well blended. Gently fold the egg whites into the egg yolk/chocolate mixture. Fold until completely combined. If there are any large egg white fragments floating around you’ll have a hard time later because the cooked unmixed egg white will cause the chocolate roll to crack. Pour the chocolate roll mix into the prepared pan and gently spread over the surface. 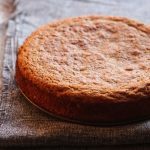 Bake for about 25 minutes, until firm yet springy to the touch and the edges appear to be lightly browned. If you’re not sure the chocolate roll is done, insert a knife in the center to see if it comes out clean. 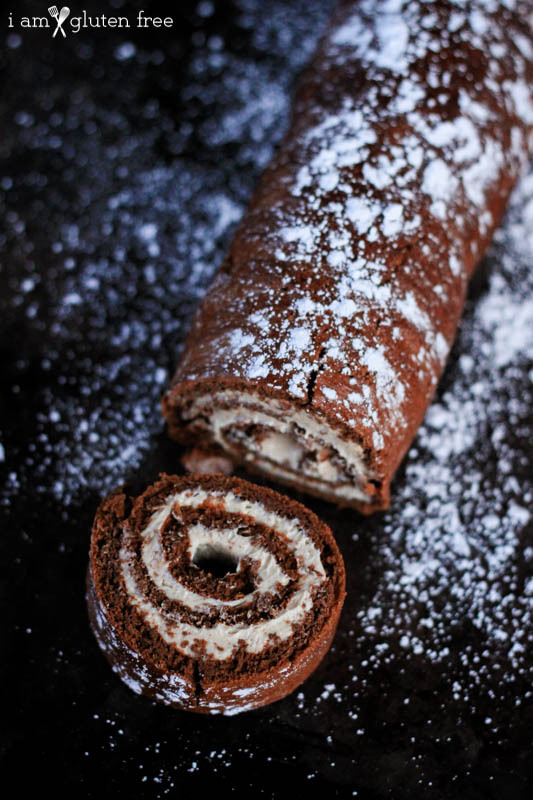 You have to be careful to cook the chocolate roll completely...if it’s either undercooked or overcooked, it will break apart when you try to roll it! When the chocolate roll is done, put a towel over it. Put another, slightly larger pan over the top of the towel and flip the whole thing over so that the chocolate roll and parchment paper come out onto the towel. Set the two stacked pans down and remove the one you cooked the chocolate roll in. Gently and carefully peel off the wax paper. Roll the chocolate roll up in the towel and allow to cool completely. As the chocolate roll cools, make your frosting (recipe below). When you’re ready to frost, unroll the towel gently. 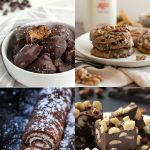 Spread the surface of the chocolate roll with frosting (some amazingly divine paleo and non-paleo recipes linked to below!) then roll it up without the towel around it. Move to another pan and refrigerate until eating (or eat immediately). 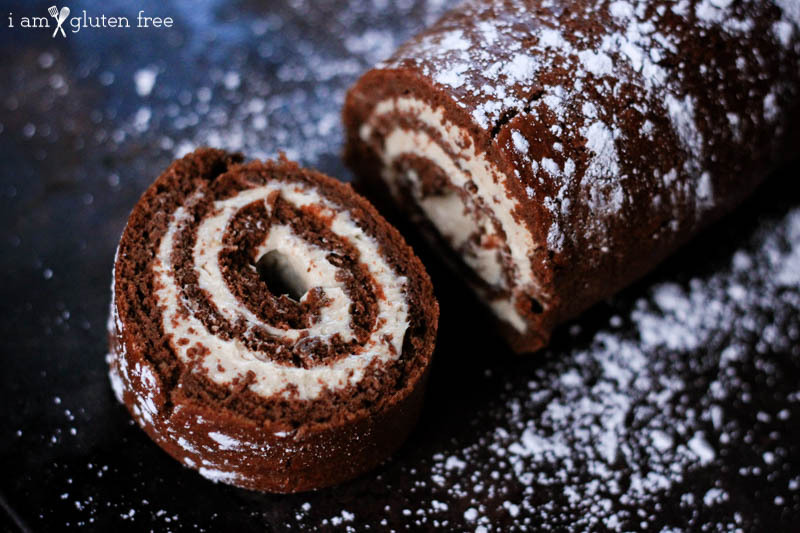 You can also fill your chocolate roll with ice cream if you don't need to avoid dairy and sugar. If you prefer to do an ice cream chocolate roll, do not unroll the chocolate roll from the towel until just before you’re ready to eat it. Then unroll, spread with softened ice cream, and roll it back up again. Serve quickly before the ice cream melts! You can also freeze for fifteen to twenty minutes before eating...just don’t freeze it too long, or else the chocolate roll will freeze along with the ice cream! I hope to publish a paleo ice cream recipe that you could also stuff this chocolate roll with, so stay tuned in the future! It has to warm up around here first…brrr! 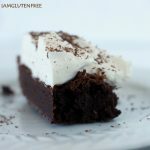 This recipe was shared in Gluten Free Fridays link up!